1975 “Logo” brand pen packaging from the Sanford Ink company. When “Logo” is the brand name, there is inevitably a trademarked Logo brand logo. Some drawbacks to such self-referential branding: When Sanford Ink put their registered “Logo” trademark on their pens, it looked like nothing so much as a placeholder for some promotional logo-imprint company. Also: I vaguely remember seeing The Gap Store’s 1979 “Logo” logo, at some time in the past, but “Logo” as a brand name makes it impossible to find their products online. Won’t find them by searching for “logo brand” or “logo clothing.” Search for “Gap’s Logo brand” and the results are all about The Gap Store’s logo—not about their “Logo” brand’s logo. 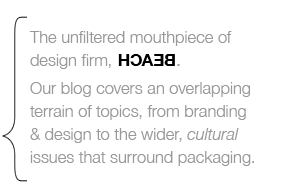 “Logo” as a brand is too ambiguous to be easily found online. We chose to name the channel “Logo” because we wanted a name that people could make their own and give it personal meaning. For us, the word logo is about identity, about being comfortable in your own skin. It’s about being who you are.